Channeling the Pentagon Channel: The New Socialist Realism - This Can't Be Happening! FNG, the Pentagon TV show "For New Guys"
Nostalgia for the Domino Theory is, however, only a small aspect of the Pentagon Channel. What it mostly does is soft features. It interviews lots of people working in military jobs that you never think about: a counselor who tells depressed soldiers that they are “part of a team, part of a family”; an MP who is proud that his Navy base in Japan has not had an alcohol-related arrest in something like 11,000 days; an artist dealing with PTSD by painting portraits of veterans; civilian employees of the Pentagon who do a few days of basic training at Fort Benning so they know what soldiers really experience. It’s like spending time with a cigarette salesman. He has good social skills, seems like he might be a good neighbor, is eager to know what’s hip with the youth of today, has a right to make a living…but he’s selling cigarettes. Most of the music is heavy metal. All the shows are half an hour, and all have segments lasting no more than three or four minutes. They rarely go more than three hours without a fitness show. They rarely go more than three hours without teaching you how to cook something. There’s a show called FNG (For New Guys) that explains how to eat great and entertain yourself in Washington DC for less than $20 a day. The host asks military trivia questions and gives away cash if you know that a lieutenant general has three stars. Since the Bush administration, the military has apparently reconsidered what it can show about itself. The Bushies famously forbade any photographs of flag-draped coffins coming back from Iraq, and did their best to minimize discussion of injuries. 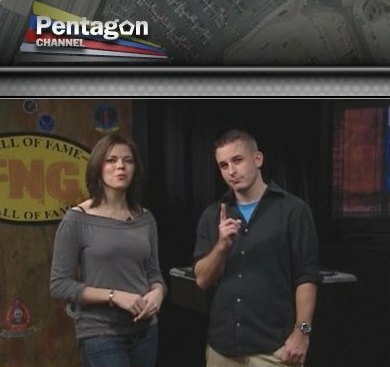 On the Pentagon Channel, they do show the occasional flag-draped coffin, always in the context of honoring the dead. With big statues and walls of names as a backdrop, veterans talk about how much they miss their fallen friends. It promises immortality as the Domino Theory, or at least the Army, lives on. The Pentagon Channel does many, many features about “wounded warriors.” Well over a million soldiers have gone through Iraq and Afghanistan, and hundreds of thousands have been physically and psychologically maimed, so maybe the sheer numbers are too big to hide under a public relations blanket. The wounded warriors are displayed playing games. Volleyball, hockey, basketball, skiing, bowling, fishing–you can do it all without legs. Camaraderie and positive thinking overcome the inconvenience of perambulating on a skateboard. If your problem is post traumatic stress disorder from shooting civilians, then “guided meditation” with a New Age shrink will help you relax. The oddest aspect of the Pentagon Channel is how completely they shield their audience—potential soldiers, current soldiers and former soldiers—from what they are defending, which is to say: capitalism. The Pentagon Channel has no commercials from corporate sponsors. No sleazy banks offering credit cards. No sleazy offers of “free” credit reports. No sleazy agriculture conglomerates showing orgasmic reactions to junk food. Instead they show internal commercials, advising young soldiers to watch their money and nutrition. They show history commercials, pointing out in 30 seconds that John Philip Sousa found fulfillment as a musician in the Marines. And they show death commercials—it would be interesting to know what euphemism they use as a label internally, but that’s what they are—showing the names of the latest casualties in Iraq and Afghanistan. The most appealing aspect of the military, beyond even the promise of glory and meaning, is how they take care of everything for you and advertise that it’s available. Want a will before you ship out? Go to legal services. Want more education? Go get your grant. Need rent money? You might be eligible for aid. It’s the nanny state. It’s socialism. People helping people for a greater cause, which isn’t profit. If the Pentagon Channel allowed more capitalism in its programming, the soldiers might figure out that they aren’t fighting for “freedom,” and then the Pentagon would really have a fight on its hands.